There are only a few types of scarecrows that we can find in popular culture and they are all dramatically different from each other. The first, of course, is the standard inanimate thing of straw and stuffing that sits in the middle of a field, hung up by wood, and just hangs out… silent and immobile… trying to spook away the birds that swing in to feed on the fields. You can usually recognize these guys by how many fat crows are perched on top of them, resting off their amazing feast. Hardly the adventurous or even frightening entity. But, it has to be thanks to that guy that we see the other two. One is a dark and enigmatic figure that hides in the shadows of Gotham, ready to infect the entire population with a chemical fear that drives them into literal madness. He’s a notorious villain, terrifying even before he’s afflicted anyone with brain-altering fear toxin, and his madness drives him to some of the most atrocious acts in the whole of Gotham. The other is a delightful guardian and a perfect mix of goofy and brave. Made literally of straw and burlap, this guy could hardly hurt a fly and is more intimidated by the crows than he is scary. Still, loveable is a quality that we certainly admire more than homicidal! So, now you have a choice to make! 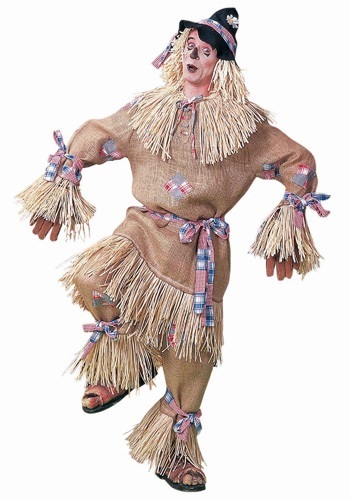 Will you be this kindly soul thanks to this Deluxe Men’s Scarecrow costume or will you turn to a darker path. If you’d like to go the kindly route, you’ll be right at home in this burlap pullover tunic with wrist ties and fabric straw bursting through your seams. The matching pants maintain the design and are bolstered with elastic for easy fitting. The belt, wrist, and ankle ties have sewn-on patches and the black cloth hat’s patchwork band completes the kindly look. Augment yourself further with some carefully chosen face paint or even find a whole crew to go on some epic adventures. Just watch out or that other guy down the shadowed streets!